"No, I was never confident. Not the first time, not even the second or the third. I always expected somebody who I never heard of would come up and beat me like I had surprised everybody in 1978." - Nine-time New York City Marathon champion Grete Waitz in a press conference with the "NY Marathon runners of the decade" including Bill Rodgers, German Silva and Tegla Leroupe. Research paper about women's participation in long distance running. 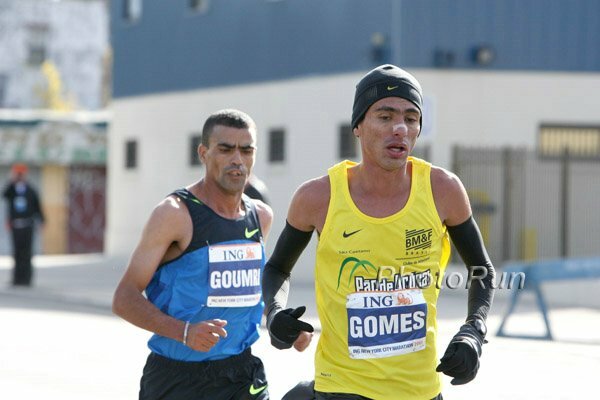 LRC: Listen To A Replay (or Download an MP3)of Our Thursday Night Live ING NYC Marathon Preview Internet Radio Show Featuring 2004 Olympic Meb Keflezighi "Meb" was the featured guest on our 2009 ING NYC Marathon preview show. Meb talked about his chances on Sunday and his resurgent 2009, during which he has won a US half marathon title, a US XC title, set half marathon and marathon PRs and broke the US 20k record. Recommended Read: LetsRun.com Previews A Marathon Field To Remember In New York You're not going to see a field like this again for a long time, so enjoy the press, the previews and the excitement this weekend. Pick the men's or women's winner with the most accurate time and win $50 from us. Find everything you need to know in our expert men's and women's previews. LRC Marathon Photo Sequence Of The Year Tom Bedford, son of Britain's running legend Dave Bedford, had a bet with his old man who said he couldn't break 2:25 in the marathon. Well, Tom won the bet this past weekend in the Dublin Marathon, and celebrated heartily, doing a cartwheel as he cross the finishing mat. A LetsRun.com reader in Ireland was on the scene, camera in hand, to record the occasion and he sent us the photos. Tom raised 5,000 pounds for charity. LRC Previews The Heps With Mike Maag and Ben True graduated, a new individual champion will be crowned in the most passionate league in the NCAA. We're rooting for Rojo's boys, but (as always) it will be a tight, nervous day at Van Cortlandt Park. Columbia might win the men's title they barely missed last year. LRC Latest LetsRun.com Cross Country Polls Are In ... Stanford Men The New #1 Stanford and Washington lead in the LetsRun voting. But will the Cardinal men even win their own conference?